We are a family owned business, providing quality services for over 30 years at the same location: 1015 N. Aviation Blvd., Manhattan Beach, CA 90266. We are dedicated to providing high quality clothing care and superior customer service with the utmost care. Our unblemished reputation has been carefully built by pampering our greatest asset: Our Valued Customers. We promise to maintain and exceed the high standards we have been delivering since 1985. "Long Standing Local Business Award". 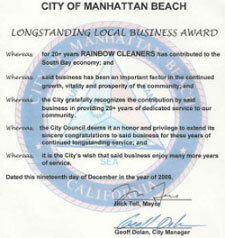 Rainbow Cleaners has been "an important factor in the continued growth, vitality and prosperity of the community". Save with our Dry Cleaners discount. Get 20% Dry Cleaning discount now. No minimum. No coupon required. 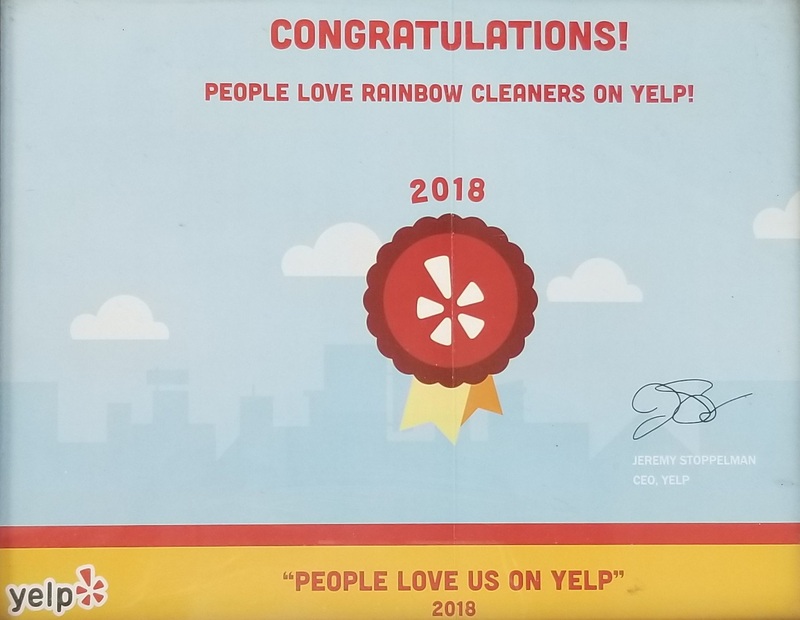 A BIG THANK YOU to our valued customers for the reviews on Yelp and for the highest ranking in the city ! We specialize in Alterations and Cleaning of WEDDING GOWNS and FORMAL WEAR. Dry Cleaning. Shirt Laundry. Fluff and Fold. Cleaning of Suede, Leather, Silk. Cleaning of Household Items, Bedspreads, Comforters, Draperies, Rugs. Shoe Repairs, Purses and Handbag Repairs. FREE Pick-up and Delivery within 5 miles, with a minimum $45 Dry Cleaning order. We accept VISA, Mastercard and Discover credit cards. We do NOT accept American Express. 20% OFF on garment DRY CLEANING only (not valid on specialty items), for 1st time customers. Cannot combine with any other offer. No minimum. No coupon required. MUST mention the 20% discount upon INCOMING orders. We request you again to please mention the discount when you DROP-OFF your garments, as this helps in saving your time and ours by not having to recalculate and re-do your receipt. We offer very reasonable rates on TAILORING, ALTERATIONS & REPAIRS, REWEAVING, WEDDING GOWNS, FORMAL WEAR, LEATHER, Comforters, Bedspreads, Draperies, Rugs and Household Items Cleaning. We periodically offer special rates. Please check back for seasonal/periodic special offers. 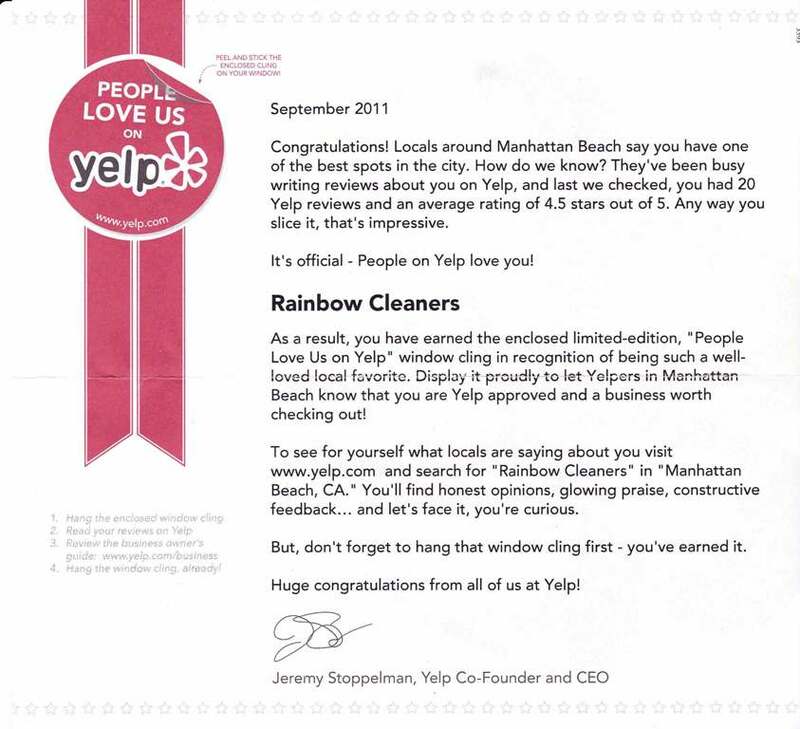 Rainbow Cleaners - "Your Garment Guru". People love us on Yelp. Click on the images below for a larger view. 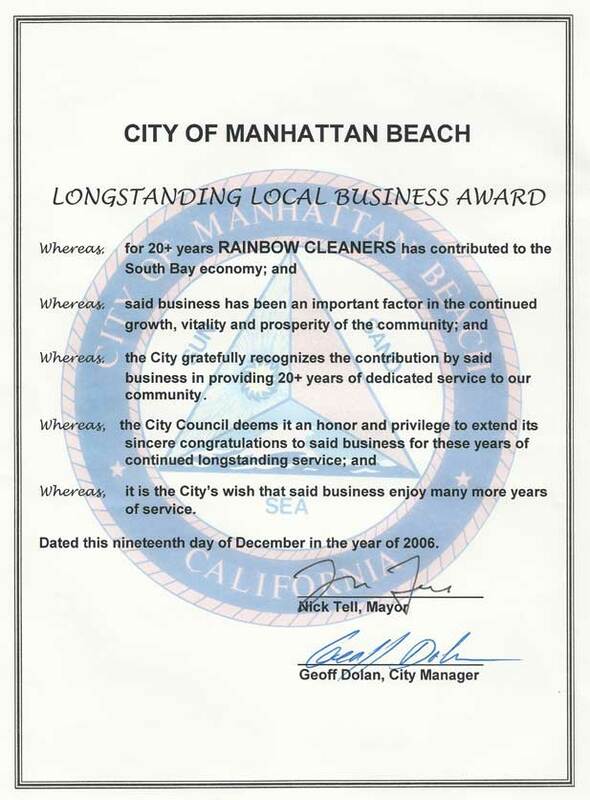 Recognized and awarded the "Long Standing Local Business Award" by the City of Manhattan Beach, California in 2006. Click here or on the image below for a larger view. Hours: Monday to Friday 7am to 7pm. Saturday 8am to 6pm. Closed on Sunday. Location: 1015 N. Aviation Blvd., Manhattan Beach, CA 90266. Click here or on the map for Directions and for a Larger map view. on the West side of Aviation Boulevard, between 10th and 11th Street. We have a private lot with Plenty of FREE Parking.